Our Omaha web design and development team builds beautiful websites we hope will be kept updated and secure. Website security is one of our passions; as it helps keeps our websites and customers in business and successful. Website security is so important to us that we have an entire team dedicated to website hosting and website security. 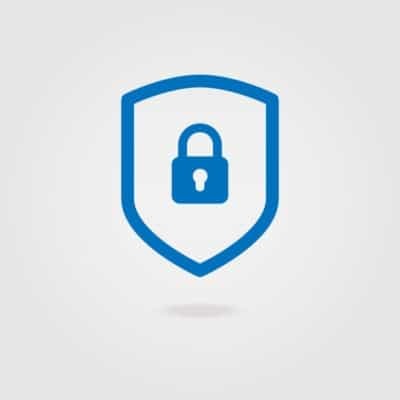 Many businesses are skeptical of needing additional security for their website. Usually they retort with, “we don’t have anything valuable on our website.” And that seems reasonable, right? The website is not collecting sensitive data or payment information. But hackers are not usually looking for this type of “valuable” information. Instead, they are looking for a clean reputation. It’s not about how popular the website is or if it takes credit card information. A clean website is the perfect place for hackers to host their own malicious content and mount a phishing campaign to collect data from users. Most of the websites our Omaha web development team builds are in WordPress. And WordPress is vulnerable to these hackers. But, WordPress and most WordPress plugins are being updated on a regular basis to resist these hacking attempts and protect websites and its visitors. WordPress and WordPress plugins do not update automatically, and require manual work to protect against the most recent threats. Additional monitoring through Wordfence and server administration are also advised for best protection. It’s the recommendation of our Omaha web hosting team to update often. So often that we offer a website security package, through which we will update WordPress and plugins the day an update is released. Taking this small step to secure your website will save you hundreds, maybe even thousands, of dollars and will protect your website visitors from phishing campaigns. So, while your website may not be collecting valuable information, and may only be a static, your website is not immune to attacks. Be educated and be proactive! As we close one year and begin another, we want to celebrate this holiday season by offering $1,000 off* the purchase of a new website! Really! We mean it. $1,000 off. Now is your opportunity to update an outdated website design, to get a WordPress content management system and finally meet Google’s mobile-friendly requirements. Taking advantage of a new website for 2018 can mean increased online presence and increased revenue. Complete our online form or call us at 402.292.7500 Option 1 for more information. From our team to yours, we wish you a joyful holiday season and a prosperous new year! * Payment must be received on, or before, December 29. Discounts apply to websites $3,500 and up. 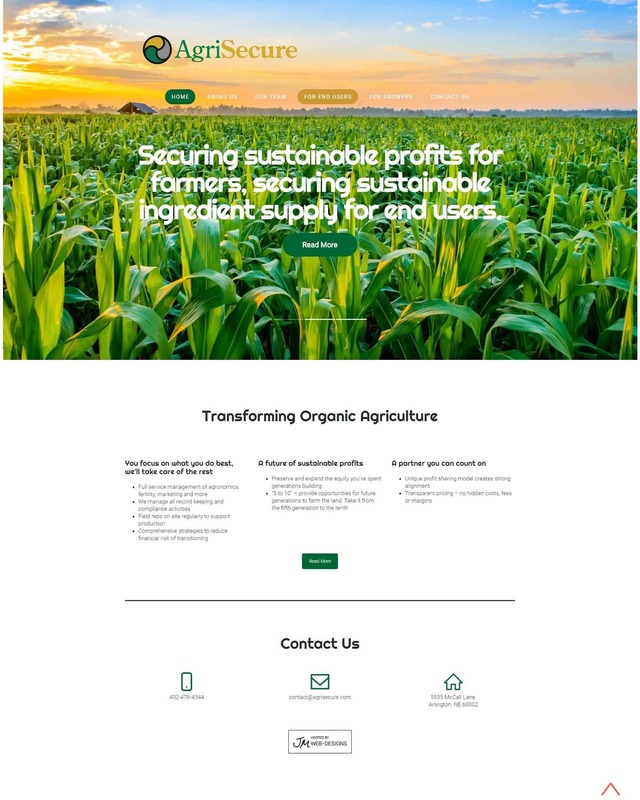 AgriSecure‘s website just needed a little sprucing up from our web design team. As most small business owners know, finding the time to maintain a website amidst the day-to-day hustle and bustle can be nearly impossible. And with the tools already in place for web maintenance on AgriSecure’s website, JM was able to jump in and assist in updating images and text for a fresh look. The AgriSecure team has worked with our web design team for other ventures, and we’re glad to provide continued support and services as we’re able. The AgriSecure website is built on a WordPress Content Management System (CMS) and our web development team is experienced in designing and developing in WordPress. This makes us a natural fit to support AgriSecure’s website. Take some time to check out AgriSecure for a sense of what beautiful images, simple text and clean design can do for telling a company’s story. 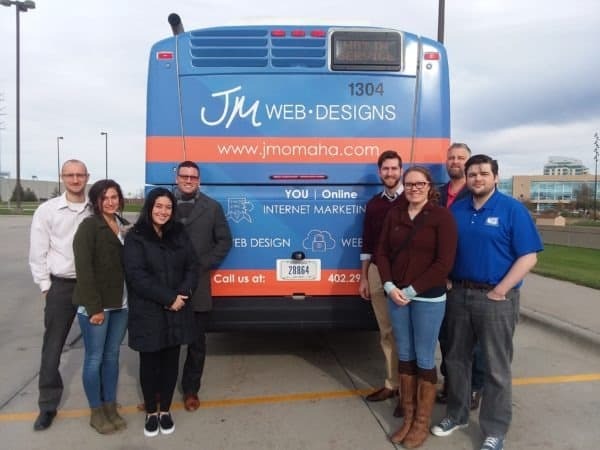 If you haven’t seen it – JM’s logo is wrapped on the back of an Omaha-metro bus. JM’s success is largely attributed to our customer base spreading the news of our excellent service and product. And we figured – a little branding can’t hurt, to reach more businesses across the Omaha-metro. The response has been wonderful… so we had to see it for ourselves. Omaha Metro Transit was gracious enough to give our team a ride and photo-op among its busy schedule. Our bus advertisement showcases our main services – web design, web hosting and Internet marketing. We’ve received responses from clients, friend and new prospects. Thank you to Omaha Metro Transit for the opportunity to ride on “our” bus, and we look forward to seeing continued success with this powerful moving advertisement. Your Family Dentist in Papillion needed a new website that would portray its inviting atmosphere, educate customers and serve as a source of credibility for Dr. Jeppesen and his staff. So, partnering with our Omaha web design team, Your Family Dentist launched a beautiful new website that accomplishes all their goals. Starting with a pre-built WordPress template, this new website is was customized to match Your Family Dentist’s branding. The robust Content Management System (CMS) allows for easy website updates, and allows for easy growth to meet their growing needs and future web marketing or Search Engine Optimization (SEO) needs. The mobile friendly website is also ideal for users on the go. Featuring a smile gallery, this website showcases their incredible customer transformations along with staff and office information to build credibility and trust before a patient ever even walks in the door. We have every confidence that this new website will provide and avenue for even more growth for this already successful dental practice. Our Omaha web design team has launched a new website for First Impressions Photography of Omaha, a long-time client. First Impressions Photography owner, Maureen, decided to redesign her website in order to meet Google’s mobile-friendly standards and increase usability for mobile and tablet visitors. This website is intended to be informational, used as a sales and marketing tool to sell photography services. With a simple WordPress CMS, First Impressions Photography is able to manage it’s albums and website information. And it’s simple design features Maureen’s work, the primary purpose of this website. We’re grateful for the many years Maureen has trusted her business to JM, and we look forward to many years of working together for her success! JM is excited to announce a new website for Fun Fitness with Fido. This lighthearted and playful design stands out in our portfolio. When a website design captures the atmosphere and values of a business, it’s building credibility and rapport. Offering obedience training, dog siting, dog walking and dog boarding in Omaha, it’s Fun Fitness with Fido’s priority to create a welcoming and loving atmosphere. 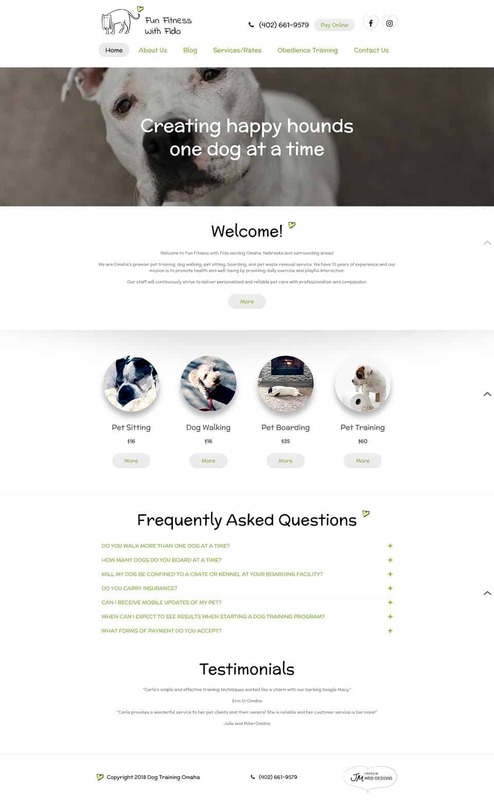 This new website design, built on a WordPress Content Management System (CMS), reflects its love of furry friends and dedication to this atmosphere. This new website design is built on a pre-built WordPress template, customized to Fun Fitness with Fido’s brand. This CMS allows for easy updating of text and images. Additionally, this website uses responsive technology to meet mobile-friendly requirements. Our Omaha web design team wishes great success to Fitness Fun with Fido as they strive for business and credibility in an online marketplace. Our Omaha web design firm was recently featured in Advantages Magazine, briefly touching on web design and SEO best practices. Advantages Magazine is a publication for distributor sales people – providing tips and tactics for success. JM’s CEO Jonathan Patton and Internet Marketing Director Megan Patton hit on website layout with a clear call to action, and properly showcasing a business’ product of services to build credibility. Additionally, a website no one can find isn’t helpful – so Jonathan and Megan provide a few tips for optimizing a website (SEO) so Google can properly index a website, and recommend businesses utilize Google Analytics for better marketing strategies. Thank you to Advantages Magazine for this feature! We’re always excited to share our knowledge for the success of others! We are living in the age of ecommerce and green initiative… which makes The Greenworld Project website launch exciting and relevant. An ecommerce website built with WooCommerce, this new website features live evergreen trees and seedlings as favors and gifts for weddings, memorials and promotional events. WooCommerce is a customizable, prebuilt shopping cart system that offers ease in building and maintaining the website. Many products on this website are highly customizable and are built using the Gravity Forms product addon – allowing The Greenworld Project the ability to offer many options and pricing for each SKU. Our Omaha web design and development team loves building ecommerce websites and equipping our customers with the technology and knowledge for success in an online marketplace. We wish The Greenworld Project great success with its new ecommerce website launch. 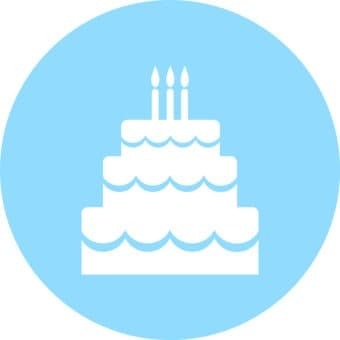 JM is celebrating 20 years this month! 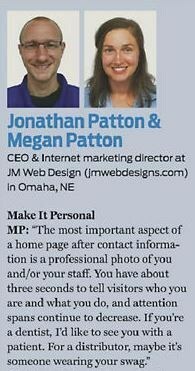 Born the same year as Google, JM’s CEO Jonathan Patton realized the importance of web design and development early-on. And so, in 1998 at 14-years-old, Jonathan founded JM Web Designs to help businesses across Omaha and the country harness these powerful tools. For years we’ve called ourselves “the endless resource for your small business.” And for the last 20 years, JM has adapted new technologies, broadened services and expanded its team of professionals to be a resource for clients. Our team works diligently with a strong sense of gratitude for YOU. Trusting the success of your business to us is no small complement, and we do not take the responsibility lightly. We are grateful for the opportunity to serve businesses across Omaha with web design, SEO, web hosting and Internet marketing. So, THANK YOU, to all our clients. It has been a pleasure and a privileged to serve you these 20 years, and we look forward to serving you for at least 20 more. Many businesses seek a new, updated website to build credibility. And really – isn’t that what we all want for our businesses? Professional branding backed by the expertise and knowledge of trusted staff. A sleek, professional website can go a long way in building credibility. But it’s the content that matters. Website content matters to Google and it matters to potential customers. You’ve likely heard it before…. “Content is King.” And your website is no expectation to this often-understated mantra. So, if you REALLY look at your website content, does it do the following? Clearly and concisely inform users of your product or service? Carefully and thoughtfully utilize keywords for increased organic SEO rankings? Portray the expertise and professionalism of your staff? And while website design preferences have changed and search engine algorithms have adjusted over the years, good content has remained a constant for a successful website. Website content creates a connection with customers and prospects. Good design partnered with good content builds credibility with customers – letting them know you are the expert, your staff is capable and your products/services are the best around. Good website content also increases conversions, because valuable information will help consumers to gain a complete understanding of what you do, the services you offer and how you can help them. As a result, your website will generate high quality leads from consumers who are truly interested in utilizing your products or services. And, most importantly, high quality website content that is optimized for the search engines will result in improved rankings (SEO) – bringing these high-quality leads through your virtual door. Do you want improved performance for your website? Improve your content! Content is king. It matters to Google, and it matters to your customers. So, get writing, or ask us to help! Our Omaha web design and development team has been a long-time partner with Pottawattamie County. For many years, we have worked with local government entities to provide new website designs and new technologies to make management easier. Most recently, we launched a new website for Home Base Iowa in Pottawattamie County. The beautiful and simplistic design of this website is targeted toward helping the county clearly and easily provide access to resources for its veterans. Built on a WordPress Content Management System, this website is easy for county employees to update and manage on their own – saving time and resources. We’re thankful for the continued trust and business of Pottawattamie County, and look forward to continued projects in the years to come!